Proust elevated grumbling to an art. Marcel Proust’s genius for illuminating pain is on spectacular display in this recently discovered trove of his correspondence, Letters to His Neighbor. Already suffering from noise within his cork-lined walls, Proust’s poor soul was not ready for the fresh hell of his new upstairs neighbor, Dr. Williams, a dentist with a thriving practice directly above his head. Lydia Davis has written a generous translator’s note, tracing much of what we can know about Proust’s perpetually darkened room; she details the furnishings as well as the life he lived there: burning his powders, talking with friends, hiring musicians, and most of all, suffering. Letters to His Neighbor is richly illustrated with facsimile letters and photographs—catnip for lovers of Proust. I have been wanting for a long time to express to you my regret that the sudden arrival of my brother prevented me from writing to you during the last days of your stay in Paris, then my sadness at your leaving. But you have bequeathed to me so many workers and one Lady Terre—whom I do not dare call, rather, “Terrible” (since, when I get the workers to extend the afternoon a little in order to move things ahead without waking me too much, she commands them violently and perhaps sadistically to start banging at 7 o’clock in the morning above my head, in the room immediately above my bedroom, an order which they are forced to obey), that I have no strength to write and have had to give up going away. How right I was to be discreet when you wanted me to investigate whether the morning noise was coming from a sink. What was that compared to those hammers? “A shiver of water on moss” as Verlaine says of a song “that weeps only to please you.” In truth, I cannot be sure that the latter was whispered in order to please me. As they are redoing a shop next door I had with great difficulty got them not to begin work each day until after two o’clock. But this success has been destroyed since upstairs, much closer, they are beginning at 7 o’clock. I will add in order to be fair that your workers whom I do not have the honor of knowing (any more than the terrible lady) must be charming. Thus your painters (or your painter), unique within their kind and their guild, do not practice the Union of the Arts, do not sing! Generally a painter, a house painter especially, believes he must cultivate at the same time as the art of Giotto that of Reszké. This one is quiet while the electrician bangs. I hope that when you return you will not find yourself surrounded by anything less than the Sistine frescoes… I would so much like your voyage to do you good, I was so sad, so continually sad over your illness. If your charming son, innocent of the noise that is tormenting me, is with you, will you please convey all my best wishes to him and be so kind as to accept Madame my most respectful regards. If you have suffered from noisy neighbours, you will sympathize with Marcel Proust. Like the discovery of the Dead Sea Scrolls in the caves of Qumran… twenty-six of Proust’s letters to his upstairs neighbor, written over a decade during the composition of In Search of Lost Time, will delight any Proustian and will tide the faithful over until new relics come to light. One wonders if the headaches of apartment living might even have inspired him, as a worthy enemy might goad one to action. A collection of letters to the neighbours about noise would seem unpromising material for a book, unless they were written by Marcel Proust, who was so sweet, kind, funny and charming that his letters of complaint, written between 1909 and 1919 to Marie Williams and her husband, are a delightful surprise. Thoughtfully curated in English by New Directions with a scholarly and rigorous afterword by translator Lydia Davis, the letters are inflected by fine observations and moments of deep empathy. They are suffused with the intimate textures of daily life—flowers and fragrance—and allow us an insight into the larger social context of the time, with reports of the wounded returning from war. Thematically, they are often concerned with art, poetry, and ruins. As a collection, they obliquely chart the passing of seasons as well as the publication history of Proust’s In Search of Lost Time. 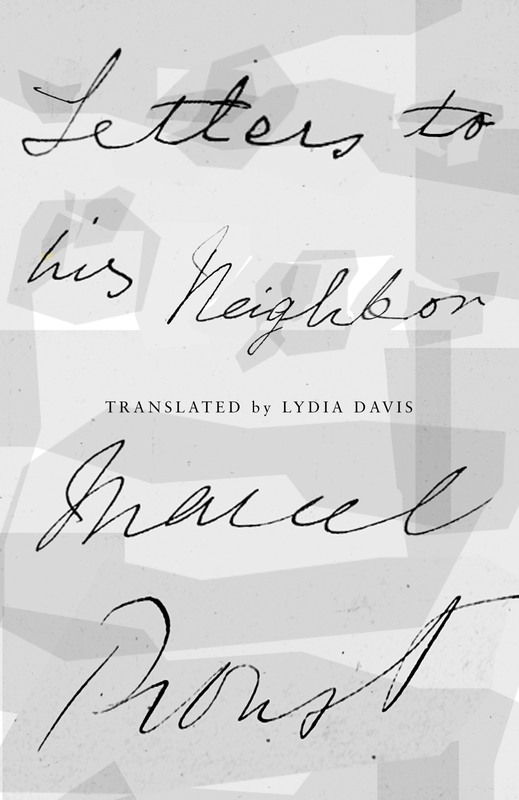 Letters to His Neighbor, brilliantly translated by Lydia Davis, is inadvertently hilarious in hyper-genteel poise; we see Proust at his most desperate, charming to the extreme, an effect no doubt amplified by Davis’s elegant prose. Proust is a charmer… it’s no wonder the exchange lasted nearly a decade. Proust whining rhapsodically about the sounds of frolicking children on the other side of his bedroom wall, as translated by Lydia Davis—what’s not to love here? Lydia Davis’s translation gives one a feeling similar to that of encountering an old master painting that has just been cleaned. Exhilarating. A sensitive and direct translation. Lydia Davis does us a great service in bringing back Proust.